THANK YOU to everyone who sent in their nominations for the Best of Dayton contest. I'm happy to announce that I received an email today stating that I am one of three finalists in the running for the Best Personal Trainer in Dayton (and the only female trainer I may add)! I am so excited and can't thank you enough for your nominations! Now on to the next step of the contest. 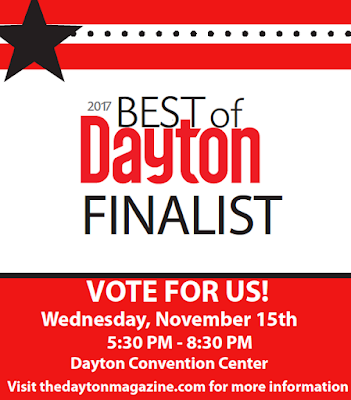 In order to vote for the final winners, you have to cast your votes in person at the Best of Dayton Party on Wednesday, November 15, 2017 at the Dayton Convention Center from 5:30 pm to 8:30 pm. Needless to say, we won't be having bootcamp that Wednesday so come join me here instead 😉! This is a packed event with finalists in all areas from the best beer, burgers and fries to the best hair stylist and hiking trails. The event will be packed with tons of food and vender give aways but in the end, I am relying on your votes in person to help me get to the top! In order to purchase tickets to the Best of Dayton Party, please visit http://thedaytonmagazine.com/…/Best-of-Dayton-Nomination.as…. The cost is $30 a ticket but if you enter the promotion code: FINALISTCODE to take advantage of the exclusive Finalist’s Friends and Family Deal, it brings the cost down to $20. Note: Tickets must be purchased in advance for the discount to apply and only a limited quantity is available. They will likely sell out so don’t wait! Tickets are on sale now. I can't thank you all enough again for your continued support all these years, without you, none of this would be possible! Thank you!! !